New thesis introduced near the university of Basilicata rewarded with the best note. The real systems, defined like ‘insiemi’ of interacting entities, are characterize to you from elevated complexity, dinamicità and chance; that renders the understanding of the behavior of the system difficult and therefore its rationalization and management. The simulation is an important instrument of support to the decisions that the opportunity to see offers to work just arranges in a computer. With the term of simulation those techniques agree that with the aid of the calculating “they imitate”, that is simulate the behavior of a system. Many of the recent packages of simulation show a tendency to go away from first form to you that they supplied a simplified approximation of the real world that they tried to emulate. The first limited simulators were introduced to the customer with and often fixed options in terms of control and turn out to you; they gave limited freedom of exploration and small interattività. Drawing advantage from the power of odierni personal the computers, from the development of the nets of transmission of the information and Internet, with emerging of concepts which connettività and convergence, with the spread of systems informed to us and telecommunicationses, are hour possible to offer simulation atmospheres that they faithfully reply the experiences of the real world. This especially in the within of the planning and the systems analysis of productive and logistic type also from part of not specialist customers. The problem of the planning of complex systems, integrated and characterizes to you from a typically dynamics nature and stocastica he difficultly turns out in fact affrontabile without the resource to simulation methodologies. In particular the simulation models concur to estimate a priori the obtainable performances from the system considered before still to proceed to its realization or modification. In this way it is possible to preview the behavior of the system to varying of conditions and parameters, to estimate all the pointers of technical and economic performances, to find the solutions more opportune, reducing the exercise and investment costs and limiting the risks. A typical application case as an example regards the problems created from the launch of a new product in production. It can be necessary in such case to estimate and to confront various configurations of the inserted interoperazionali warehouses between the several ones is made of the production process, with the scope to maximize the productive ability. Moreover, in the within of the political of maintenance to adopt, porsi can the problem verify the effects induced on the system from eventual breakdowns or wrong operations of means of production; problems of this type can easily be face to you with simulation methodologies. The analysis of the dynamic behavior of the system under investigation. Making reference to the problem of the corrected dimensioning of the systems of material handling it characterizes to you from an elevated level of automation, turns out obvious like the complex nature, integrated and dynamics of the problem it often renders the resource to simulation methodologies unavoidable, above all in presence of one strongly variability of the flows of materials. To orient in the choice between the various languages and packages software available for the simulation constitutes a not negligible problem from the moment that one chosen mistaken can render difficult, if not impossible, the “modellizzazione” of a particular considered real system. As far as the systems of productive and logistic type, the more opportune choice between the various types of software available on the market must be made with criterion so as to to concur with the expert customer not to estimate preventively the problems which encounter will go having decided to resort to simulation techniques and therefore to estimate the resources (temporal and economic) and the competences (computer science) above all necessary. to increase the satisfaction of the customer. Draft therefore of the search of the excellence that pushes the enterprises to adopt methodologies of simulation more and more oriented to follow more rises levels to you than efficiency, effectiveness, flexibility and reactivity. In order to analyze a system and therefore to obtain usable information from the planner in order to improve the same one, it is necessary to construct a model from being able to study. The models can be physicists or matemati to us. In the study of the productive or logistic systems they come uses mathematical models you to us that they represent a system through logical and quantitative relations; these relations come modified in order to see as the model reacts and therefore as the system reacts. If the mathematical model is simple can be studied analytically, obtaining therefore one exact solution. If instead the model it is rather complex uses the simulation, since the analytical study would be much expensive and difficult one. In this case the model, called simulation model, comes codified using a programming language and comes resolved numerically leaving from sure input in order seeing as the output are modified. The fundamental factor that plays, therefore, in favor of the use of simulation techniques is constituted from the extreme flexibility of employment, that an easy “modellizzazione” of real however complex systems concurs, escaping to ties and to the simplifications you set up from the methodologies of analytical type. One first classification of the mathematical models sees the stocastici distinction between determinist models and models to us. In a determinist model not there are probabilistici elements, while these are present in a stocastico model. Introducing the data of income in a determinist model a fixed result is obtained; in a stocastico model instead they are introduced given problems and a problems result is obtained, that is an esteem of the real characteristics of the model. The elevated complexity of the system, the existence of variable problems, the requirement to analyze the dynamic aspects or of transitory, the necessity to hold account of eventual breakdowns or wrong operations force to address towards “stocastici models of simulation”. Also such models introduce some disadvantages; the employment of a simulation model only concurs to answer to questions of the type what-if, that is to estimate the performances of the system to forehead of specific assigned configurations. The planning process comes in such case to shape itself like a process for tried happened to you to you: beginning from a limited range of progettuali alternatives is possible initially to confront, on the base of the obtainable performances, the various configurations of the considered system and subsequently to explore, for those configurations that turn out more convenient, the possible attainable improvements with various criteria of dimensioning or operating political different. This intrinsic limitation of the simulation techniques can partially be exceeded by means of the employment of opportune methodologies statistics that concur to estimate, for an assigned configuration of the system, the main relations that tie the variable progettuali with the variable ones of performance; it becomes, therefore, possible to exceed an approach “for attempted to you” and characterizing with of progettuali choices that favor the optimal operation of the system. An ulterior classification for the mathematical models to us regards the distinction between models of “continuous” type and models of “discreet” type. In the first case the characteristics of the system as an example endure changes of state of continuous type (the characteristics of the fluid inside of process systems), in according to case the changes of state inside of the system are taken place only in correspondence of discreet temporal intervals. The simulation models consider you in the systems of material handling in the manifacturing industry are discreet, dynamic and stocastici, and are call to you discret-event simulation model. In these models the variable ones of state can only change in sure moments of time. In these moments an event only can happen, term with which a whichever instantaneous event agrees that can modify the state of the system. The operations of coding necessary in order to construct a model go framed in a process of study of the system that follows various steps. This process is not a simple sequence is made, in fact it is necessary to return to the previous step every time that more and more acquires acquaintances deepened on the system. Formulation of the problem:it comes defined the system to study and its it objects to you. Collection given:quantitative observations and data are collected you on the system. Construction of the model:they are formulated of the hypotheses and the model is constructed. Validazione:account of data more and more deepened is necessary to confront the characteristics of the model with those of the system being held in order to make to increase the credibility of the model. Construction of the program:the program in a generic language or of simulation is written. The employment of a simulator user-friendly can simplify very this activity regarding uses it of a generic language of programming. Validazione:they are carried out of the pilot run in order to see if the output of the model they are approached output of a already existing system having same characteristics of the model. If the output they are not in agreement then they modify the hypotheses and the same model. Definition phase experiences them:the optimal values of the time of simulation must be established, of the conditions begin them, of the necessary warm-up period, and number of run of simulation. Phase experiences them:the run are carried out of simulation. Analysis of turns out to you:they come elaborates turns out to you to you using the techniques of statics in order to construct intervals of confidenza for the measures of the performances of the system. Presentation of turns out to you and they implementation. variable exogenous or ties:they regard the limitations taxes from the planner, is for how much concerns the configuration of the system that the previewed operating conditions for its operation. 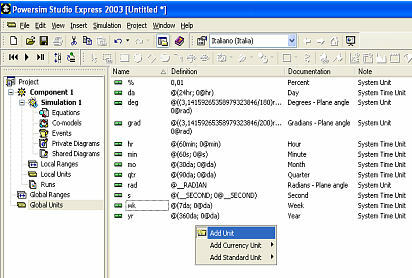 The simulation program supplies, for every iterance, a series of relative observations to the variable ones of performance (variable employee) in correspondence of assigns exogenous values to you of the variable ones of decision and variable (variable the independent ones) and moreover the continuous monitoring of their course concurs, like represented in figure 1.1. ATTRIBUTES:variable permanent (numerical or the logical ones) that they stablily characterize the relative largenesses to the entities or the resources of the system. ATTIVITA’:operations carried out from in transit blot of it on the entities (as an example those of transformation or movimentazione). To ciascuna activity a duration is associated, of determinist or stocastico type, famous at the beginnig of the same activity (the delay of an entity in a tail is not an activity in how much does not have a famous duration but it depends taking place itself of sure conditions). TAILS:with of entity in wait approaching detailed lists it blots some according to defined priority rules. EVENT:instantaneous to take place of a phenomenon that modification the state of the system. As an example the withdrawal of money of an entity from a wait tail constitutes an event, is because the warehouse comes to contain a smaller number of parts, is because modification the general situation of the system. In correspondence of the events changes in the variable ones are produced of state. you condition:they can only happen if determined conditions are satisfied. SIMULATION CLOCK:it is the element that supplies the time simulation current. Naturally not there is some relation between the time of simulation and the time necessary in order to carry out a run of simulation on the calculating. Taking for example an assemblage system, the entities correspond to the products in phase of completion that journey through the job stations; to every type of entity attribute corresponds an assigned cycle of assemblage (); it blots some correspond to the job stations that carry out assemblage operations (activity) with various durations to second of the type of product; it blots some can be found in the occupied state of free or of; the tails correspond to the buffer of accumulate of the products in wait to approach the stations that are found momentarily to the occupied state of. To the first category which Pascal, C, Fortran, etc. belong those languages of programming to high level., than being it specifically does not dedicate you to a simulation activity, demand from part of the programmatore one greater effort for the implementation of all the mechanisms and the structures of necessary data in a simulator. On the other hand, just because draft of languages generates them, and therefore a lot known, they do not create excessive problems to the level of use. The second category is constituted from those obtained languages adding to the languages generates them existing, typical functions and costrutti of the simulation under the shape of bookcases of sottoprogrammi or richiamabili procedures from the program of simulation written in a language general purpose. Languages of simulation in a position to facilitating the task of the programmatore exist by now on the market various, than with the aforesaid languages it is in a position to writing with little entire lines of program models or sottomodelli that otherwise they would demand much longer times of drawing up with consequent increase of the error probability. To these advantages, however, which can contrapporre some disadvantages the smaller efficiency (so that of usual the time of elaboration increases) or to the insufficient spread of the language same due to the fact that only a narrow number of persons is in a position to padroneggiare this type of language effectively. simulation oriented to the activities (activity-based). The simulation oriented to the events, typical of the languages of programming defined previously as it generates them, considers a series of events that can be taken place in the course of the evolution of the system; every event is described from a subroutine that can modify or less the state than all the members of the system. to the term of the phase of scan the system it comes newly analyzed (phase of rescan), verifying if the conditions exist in order to begin more or of the relative activities that the system is in a position to carrying out and modernizing the variable ones of state. With of the under way activities during this phase it concurs to define the list of the future events, correspondents to the moments in which the under way activities finish. During this phase the time of simulation remains firm. In the approach oriented to the processes the simulator is constituted from with of procedures that describe all that that succeeds to an entity that progressively it crosses the system; the model therefore is described from a diagram block by block, everyone of which represents a process, it connects to you from each other from arches orients to you along which the entities flow. In every language of simulation oriented to the processes it is present with of macro-instructions that automatically translate a sure number of situations that are introduced more frequently during a simulation model. The approach process-based particularly seems to be adapted for the description of the production processes, but it can involve complications when the operations are involved various types of resources. The approach oriented to the activities demands the definition of the necessary conditions for the beginning and the term of ciascuna activity previewed from the model. This presupposes the existence of a module of the program in order to define every activity that engages the entities; the same module includes a test in order to determine if the activity can be begun and if the actions are eseguibili. This type of approach is easiest for a not-specialist and is undoubtedly simplest from the point of view of the programming. The simulation languages base to you on last the two approaches concur to represent the system under investigation describing to the sequence of processes (or activity) that ciascuna entity crosses at once in sequence from the moment of income in the fine system of escape. Of it remarkable simplification in the programming job achieves one. The system under investigation can that is be outlined like a net of nodes or blocks constituted from blots some, tails and points of distribution, through which the covered entities journey following differentiate to you to second of the specific attributes assign to you to ciascuna of they. To every type of node it corresponds, from the point of view of the simulation program, one macroinstruction (as an example: activity for one machine, queqe for one tail, etc). 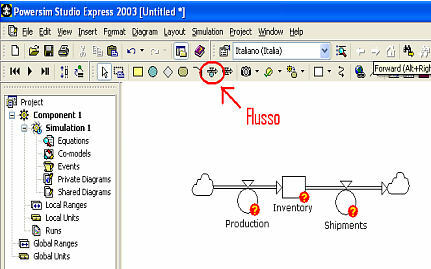 To the programmatore the task only remains to choose the macroinstructions that describe the nodes of the system, to assign for ognuna of they the parameters that they characterize the operation of the corresponding node and to establish the necessary connections between the various macroinstructions (correspondents to the existing connections between the nodes of the net that describes the system). documentation (manual and operating guide exausted to you), training (examples of resolved problems or course finalize to you), attendance, continuous modernization of the product, possibility of exchange of information and experiences between utilizzatori. 2.3.2 Variable members of the women's army auxiliary corps, constants and flows of information (connections). Many models of simulation contain variable that they change continuously. In other models the changes of the variable ones happen gradually in a period of extensive time; however they can be dealt like continuous. An example could wholesale be the amount of the inventory of a store, in a productive system of distribution, the course of many years. In the moment in which the question of the customer it is fulfilled the inventory is emptied and that induces to a new order towards the factory in order to re-establish the supply in warehouse. With the time, particularly if the orders are small and frequent, as it happens in the just-in-Time system, the level of inventory can be represented from a continuous function. Variable the continuous ones are often variable calls of state. A continuous model of simulation defines the equations for relazionare between they the variable ones of state so that the dynamic behaviors of the system can be study to you in the course of the time. A methodology in order to simulate the continuous systems is a activity-scanning approach in which the time it is subdivided in small you leave. Le equazioni che definiscono il modello sono usate by determinare come le variabili di stato cambiano durante un periodo di tempo. A specific methodology of continuous simulation is called system dynamics (SD) that is dynamics analysis of systems (ADS). System dynamics is a methodology of simulation based on it uses of the computer developed near Massachusetts Institute of Technology (MIT) in the years fifty like one instrument for the managers in order to analyze complex problems. Nowadays its main public is constituted still from the managers even if its I use has extended also in academy, where university professors and students use in order to model it systems of every conceivable discipline, from the history and literature to Biology, physics and economy. The word “dynamics” implies continuous changes and is that that the dynamic systems make – they change continuously with the time. Their position, or be, is not the same today like it was yesterday and tomorrow it will change still. De la “eventi no a solas del gli de di vedere del possibilità del la del silicio ha simulación de la dinámica del sistema” de Usando, tempo del mA anche modelli di comportamento col. The simulation is is time behind to turns out to you historical but it watches ahead also in in order foretelling the possible ones turns out to you future. SD extension as the structure of a system is the cause of its successes or failures. This structure is represented from a series of relations causal connected between they. The simulations of the dynamic systems not only serve to communicate what you would happen, but also because. This because the simulations are planned in order to correspond to what it is, or it could happen, in the real world. System dynamics focuses on the structure and the behavior of the systems that are composed from interactions between variable. A system dynamics model usually it takes the shape of an infuence diagram that extension the relations and interactions between a set of variable. System dynamics is, therefore, an approach experiences them to the systems analysis. A way in order to understand complex systems modifying them or changing them in some way. It is also an approach for valicare or estimating the consequences of a implementation analytics of a model or recommendations for a report of a study case. simulation and test of the model. This result can be caught up is implementing the model of departure synthesis, is developing other models and integrating them from each other. The process previews translate (to transform) the formal model in model computerized before in order to verify of the behaviors, then in order to verify the decisional political in existence, projecting them and simulating some it is turns out to you is the impacts acclimatizes them deriving from the eventual performance of the decision to take. Every enterprise has of objects to you, more or less it formalizes to you, and it is task of the organization to monitorare the trend managerial in order to guarantee the attainment of objects to you same. SD can model to the effect of the feedback information (feedback information) on the future direction of the model. As an example if the time of the cycle of a production process becomes excessive, the management would take part typically in order to bring changes to the same process, while simulating several times the process would evidence simply that the time of the cycle was continuing to grow. System dynamics maneggia tutto ciò facilmente. In order to facilitate the use of the feedback of information SD it accurately separates to the accumulated information on the state of the system and the information fed from that state in order to control the evolution of the future states. These two characteristics key qualify a model of system dynamics addressing in appropriate way situations that evolvono with the time. System dynamics uses a set of instruments that allow the professionals to visualize and succintamente to represent mental models of a system, to communicate those models to the others and to increase the understanding of the systems. Not there is a single formula for the use of everyone of these instruments, but there is a number of suggestions that can help to clear and to allow to understand the power of theirs use. The simulations of the dynamic systems are based on the principles of cause and effect, feedback (feedback) and delay (delay). Some simple simulations incorporate one or two of these principles; more sophisticated simulations use all and the three principles in order to reproduce behaviors that are met in the real world. Cause and effect are a simple concept; it means substantially that it sets in action and decisions have consequences. The price influences the sales, the births influences the amount of the population, the publicity influences the market. If these relations of cause are taken an examination and effect isolatedly, is easy to understand. However when cause chains of and effect are arranged in long they can become complex. This is an optimal reason in order to use the simulation. The human mind is good in developing intuitions in order to resolve complex problems, but it is poor in monitorare dozens, hundred, migliaia of interconnections and relations of cause-effect. Causal-loop diagrams: often they are used in order to illustrate the relations cause-effect. In such diagrams they are used of the arrows in order to indicate relations. Sometimes, in the diagram, the regarding information are included also the way in which the relations they work. “Or” added in the diagram it implies a “change in the opposite direction”. In the relation between price and sale, a price increase induces to one reduction of the sales. The relation between births and population is various from previous in how much an increase of births implies a population increase. This last one is a situation in which a change it induces to an other change in the same direction. In order to indicate that one “s” to the arrow in the diagram joins. Figure 2.1 extension a simple one causal-loop diagram in which the price it has an effect negative on the sales that in its turn an effect has negative on the unit cost that in its turn has a positive effect on the price. Figure 2.1 – A simple one causal-loop diagram that it illustrates the logons between price, sale and unit cost. Feedback is a concept that many persons associate to the microphones and loudspeakers. A microphone that is not shaped in appropriate way will collect the coming from sound from its same loudspeaker. This sound will come amplified ulteriorly from the loudspeaker and collected newly from the microphone. This process goes ahead until the loudspeaker that is producing sounds amplifies can make it to you or the microphone cannot collect ulterior sounds amplifies to you. If the microphone and the loudspeaker were it sets up the system correctly to you would work linearly. This is the general principle of feedback. Some chains motives are connected so that cause and effect ripercuotono one on the other. This happens everywhere in the real world in all the types of systems, although the persons of are not often aware. To fix the competitive price is a feedback example. Every fixed vendor the price basing it on that one of the just concurrent one and therefore via. Simple causal-loop diagram figure 2.1 illustrates the feedback like approval in the price example and sale. If a strategy were used in order to fix the price based on the costs, it could be shown that as they increase the sales, the unit cost for product comes down. As the unit costs come down, the prices decrease also. If the price comes down, the sales go up. Relations of feedback can produce a great variety of behaviors in the real systems and the simulations of the real systems. Figure 2.2 extension four common behaviors created from several feedback cycles. Oscillations. (Example:oscillation of the inventory). All the relations of cause and effect do not happen instantaneously. Some time the consequences of an action or decision do not appear until many days, months, years after the accadimento of an event. Difficult to understand a system when the consequences cannot be seen in proximity of the behavior. Many decisions have consequences that cannot be known for years and they cannot never be connected to the first errors. Delays can produce interesting and complex behaviors in the systems also when they do not have feedback and limited complexity of cause and effect. In order to illustrate this it can be still watched the example of price and sales. The unearned income for a line of products is determined multiplying the prices with the sales. Increasing, therefore, the price or the sales will be an unearned income increase. The demand for usual is influenced from the price even if not immediately. The customers can demand time for regulating their models of consumption after a change of price. This can happen because they have imperfect information on the alternatives or the infrastructure that are forcing them temporary to a specific one chosen. In this case the connection between price and sale differs from that one introduced in the causal-loop diagram previous for added of one the delay (delay) like shown in figure 2.4. Figure 2.4-Effect of the change on the sales it is illustrated from a delay. Since not there is delay between price and unearned income, when the price variation happens, before what that happens is that the unearned income knows them. Eventually, however, the consumers are able to correct their models of consumption and the sales come down provoking low unearned incomes. The behavior of the unexpected variation of price and the ollowing changes in the sales and the unearned income can be seen in figure 2.5. Figure 2.5-When happens an unexpected variation of price, has an immediate increment of unearned income. Since it comes been involved a delay (delay), the sales will not decrease immediately. After a sure time, however, the sales will fall, giving as turned out an unearned income decrease. To understand the concepts of cause and effect, feedback loops, and delays offers a good base when it is begun to discover the complexity of the nature of a system – which elements are acting on other elements and if the interaction is positive or negative. The feedback cycles, however, do not indicate by themselves what it will be the behavior of the entire system. Difficult to anticipate the behavior of a system from a causal-loop diagram that it represents the retroactive structure of a single system. The characteristics of System dynamics as soon as described they are generate them, but their implementation demands uses it of specific software. A high different number packages software is available in order to implement system dynamics and, for the development of this thesis the choice has been oriented the package of modellazione Powersim Study. Powersim Study is an atmosphere of modellizzazione based exactly on science of the dynamic systems. Powersim allows to model systems – with all their relations of cause and effect, cycles of feedback and delays – in graphical and intuitiva way. The symbols that represent variable levels, flows and “of aid” (so-called members of the women’s army auxiliary corps) are used in order to create graphical rappresentazioni of the system in Manifacturing diagrams (Constructor diagram). Flows and connections of information represent relations and interconnections. 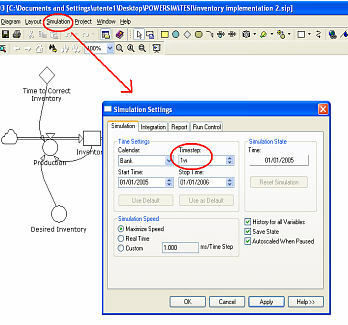 The entire structure of a system, does not import like complex, can be represented in Powersim Study with the use of these variable types of and connections. When the simulation of a dynamic system is created, the feedback structures (feedback structures) represent through the use of levels and flows. Every element in a feedback cycle, and therefore every element in a system, is or a level or a flow. The levels are the accumulations in the time while the flows represent activity, movements or variations that modify in the course of the time the levels. The flows fill up or exaust the levels. This action of the flows that are accumulates to you in levels is the cause of all the dynamic behaviors of the world. In integrating one function, simply measure the area under the function dividend in sections of equal amplitude and then adding the area of all the sections like illustrated in figure 2.5. When a model of graphical simulation in Powersim is created Study, connecting the symbols of the variable ones generate the integral equations (flows). Every variable in the model it is defined from an equation, in the same way with which the cells in a sheet of electronic calculation are defined. The levels are represent to you from cases and indicate the accumulations that they can increase or diminish in the time. The levels can be only modified through the flows. The flows are actions or processes that add (afflusso) or embezzle the accumulations in the level. The clouds at the beginnig and to the end of the flow represent the source and the end of the structure. The cloud symbol indicates infinite amount and marks the border of the model. The flow is represented from the double arrow and the circle on the flow is behaved from outgoing tap that controls the entering flow and. In the example of figure 2.6 the level is the “measured force-job” in persons, that they are you increase from the “percentage of assumptions ” (flow) and diminished from the “percentage of lay-offs” (flow). The clouds indicate that in this model it does not interest from where the persons come recruited or where the fired persons go. Those information are beyond the borders of the model. 2.3.2 Variable members of the women’s army auxiliary corps, constants and flows of information (connections). One is hardly inasmuch as it is possible to only create an entire model with levels and flows. Powersim Study has some instruments added to you that they help to capture the phenomena of the real world in a model. To realize a sure level of detail or to help in the formulation of equations for the percentages of flow, is some time necessary in order to model one variable like helping like shown in figure 2.7. Figure 2.7 A variable member of the women’s army auxiliary corps is used in order to arrange or to reformulate information; she does not have a shape standard; it is a algebrico calculation of some combinations of levels, flows or other auxiliary ones. Even if the variable members of the women’s army auxiliary corps can seem of the accumulations, they various do not have no memory from the levels. The auxiliary ones are used in order to model information, not the physical flow of assets, therefore they change without delays, instantaneously. They can constitute contributions to the flows but never directly to the levels, because the flows are only the variable ones that can change their levels associate to you. Variable of flow and the auxiliary ones are defined exactly to the same way; the difference is that first they are connected to the flow valve and with that they control the flow directly. The constants are, various from the variable ordinaries members of the women’s army auxiliary corps, constants in the period of time of the simulation. A rumble represents to them, like shown in figure 2.8. Figure 2.8 One constant is defined from a value begins them, and maintains to this value in all the simulation, less than the customer not changes manually the value. As an example in a simulation of a year a society can have an essentially fixed force-job that it can be represented from one constant. If the simulation were expanded to twenty years, the force-job could be dealt like a level and be induced, therefore, to vary in the time. There is therefore need to define the temporal borders of the model. Without a clear definition of the model to define it is not possible to fix the correct borders. Some time is not clear if an element of the system must be dealt like one constant or like a level. It would have to think next to the period of time of the problematic behavior and if it is or he is not reasonable to expect that that element changes in that period. In this way it is placed to us in a better position in order to decide which elements would have to be constant and which would have to vary during the simulation. The connections of information are made between constants, auxiliary and levels. These connections have the aspect of thin connectors, like shown in figure 2.9. Figure 2.9-I information connections connect various variable The connections show as the elements characterize them of the system are puttinges together. They close the feedback cycles. Already it has been looked at like the flows change the levels filling up them or exausting them. The information connections can transfer of new the value of the level to the flow, indicating one dependency of the flow on the level, therefore like the dependency of the level on the flow. To every variable it goes then associated an equation that allows the calculating to determine the value of the variable ones and their variation in the time. It is obvious that if a model is wanted to be obtained much faithful to the truth, to establish the just equations it will be a job not less onerous that to construct the structure of the model; often it will be even impossible to use true and own equations, and it will be rerun to systems of tables that bring back “the true” values. However, for having an idea of principle of the behavior of the usual model they are sufficient truly elementary equations: therefore it is already succeeded to obtain many rivelatorie information on the behavior of principle of the system, and on the type of strategies that can be adopted. 3. To work with Powersim Study: introduction to I use it of the software through a practical example. 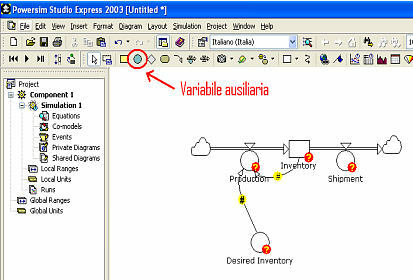 3.2 Example of application : construction and implementation of a model that simulates the management of the warehouse of one manufatturiera industry. 3.6 Dependency of the production from the inventory. In chapter previous they have been introduces the concepts to you and the principles generate them of System Dynamics on which the Powersim software is based. It is inasmuch as expressing them variable of a problem through graphical rappresentazioni which levels, flows, constants and connectors of information it is possible to visualize a system in graph form more or little complex and to study of just the behavior. In fact once inserted the conceptual model in the computer through Powersim Study and, defined in appropriate way all variable and the equations that constitute it, can be simulated the model and be seen its behavior in the time. If it differs from the expectations of the planner it could as an example be that the structure of the model contains errors , like the mistaken definition of some variable ones. A manifacturing industry is considered that decides to use of the simulation in order to understand better and to study the interactions between the orders of the customers, just the warehouse and the levels of production. From the moment that the society often states oscillations in just the warehouse and the levels of production, it thinks opportune that the first step in order to resolve this problem is that one to construct a model that explains the relating interactions. Politics of production of the society are that one to increase or to decrementare the level of the warehouse in such way that it is that one wished and to maintain a level of supply enough high to cover the future demand that they expect. In more the production it is organized so that sixth of the discrepancy between wished inventory and that one puts into effect is corrected they every week. Their assumptions approximately the future demand are based on the percentage of running order. This last one represents the real demand that the society faces. Their politics in order to formulate the waited for demand are simple. It is wanted to be corrected eighth of the difference between the real ones and waited for demanded every week. When their supposizioni, approximately the future question, change, it comes hit their wished level of warehouse and the rate with which they produce objects (widgets). When the objects are produced they go directly in warehouse. No product can go directly from the production line to the customer; it must go before in the warehouse. From here that the deliveries leave. Since the society maintains to a greater warehouse four times of what it thinks is necessary anytime, it believes of being able to send the products necessary in order to fulfill to every order. In this simple model they are not considers therefore the back orders you (backlogs) and their effects to you (an inventory negative would represent a rear job). The first operation to carry out in order to construct to a model with Powersim Study is that one to create the units of measure used from the same model. Powersim Study contains already one series of ordinary units of measure (time unit, of length….). To these it must add, creating it, the unit of measure for “object” (“widgets”) necessary for the taken model under investigation. Rinominare the new unit added with the name “wdg”. Unit of point (point unit) only defines a point on one scale. derivative (derived) must derive from other units. 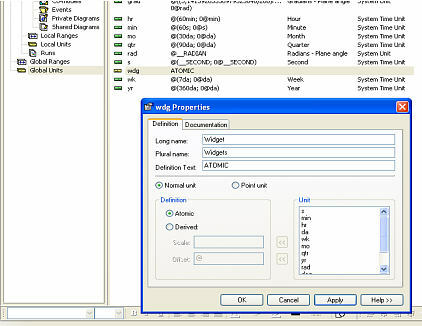 In the event in issue the unit “wdg” is a normal unit because it is used in order to measure a number (without a position absolute in the scale) and atomic because it is not derived from the other joined one predefined in Powersim. Hour the unit “wdg” can be used for the construction of the model. An inventory represents an accumulation of elements, “widgets” in this case. It is modeled through a Level that, like has been explained in chapter previous, represents an accumulation in the time. Selecting then the created level the rinomina with the name “Inventory”. The variable one inserted will appear, but, with an interrogative point (fig.3.3) that it indicates that the variable one is not still appropriately defined. To drag the flow in the Level previously created and rinominarlo “Production”. The same operations go carried out in order to create and to connect to the “Inventory Level” the shipment flow (Shipments). Also in this case a cloud that indicates the other border of the model, like brought back will appear in figure 3.4. Figure 3.4- Production is modeled like flow entering in the Level while Shipments like outgoing flow from the Level. From how much it has been said the production before depends on many factors, included the difference between the inventory it puts into effect them and that one wished. On the moment that the flow rate productivity (Production flow installments) depends on the level of the Inventory is necessary to create a connection (information link) that extension this relation. 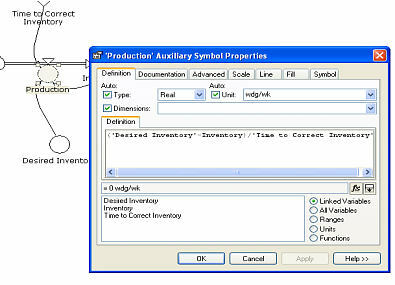 Figure 3.5 – The dependency of the production from the inventory is modeled from the Link (connection). 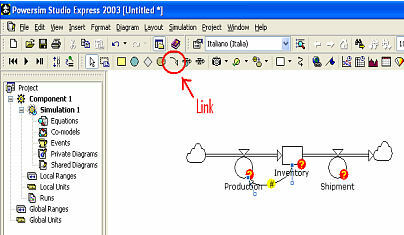 The symbol # on the link indicates that the variable ones connected still are not defined in appropriate way. In order to represent the difference between the inventory they puts into effect and that one wished in the equation of the production is necessary one new variable. The wished inventory (Desired Inventory) is not an accumulation but rather a value determined from the manageriale direction of the society based on the running inventory. For which helping it is the best rappresentation for this variable one in the implementation of the model. The third member of the production is the time necessary in order to fill up of new the inventory. This factor of time represents a delay in the system because in the real life, the production cannot instantaneously fill up the inventory. Time in order to produce the assets materially to us wants and to transport them in warehouse physically. In this case sixth of the discrepancy between inventory they puts into effect and that one wished is corrected every week. Therefore, when the level of the wished inventory changes, they want six weeks to us so that the level of the inventory puts into effect them changes consequently. This factor of time does not change during all the simulation and comes therefore represented from one Constant that, as already it has been seen is represented from a rumble. The model still is not ended but some of the variable presents can be defined. The level “Inventory” is defined first of all. In the box of definition to insert the number begins them of objects (widget) present in the inventory, as an example 400. Applying these modifications to scompare “?“on the symbol “Inventory” since the variable one it is hour correctly defined. However the points interrogated to you on the other variable ones are still present since they still must be defined in similar way. The constant of time “Time to Correct Inventory” represents the time necessary in order to modify the inventory puts into effect them so that it equals the wished inventory. The time delay (delay) in order to fill up the inventory was six weeks, that it is also the value of the time constant. In Powersim Study the equation can be introduced that directly defines the variable one in the field in which the name becomes part, without the necessity to open the window of the property. This is favorable above all in defining the constants. Even if the variable “Desired Inventory” will come later on redefined, can be assigned a temporary value for being able to define the variable “Production”. Therefore, at the beginnig of the simulation, in which every thing he is stable can be settare its equal value to that one of the inventory and therefore 400 < < wdg> > in the same way in which it has been defined “Time to Correct Inventory”. Expression that goes inserted in the window of definition of the variable “Production”. Figure 3.10- Window of definition of the variable “Production” In this way they are passings i “?“relati you to the variable ones been involved in the previous expression. The unit of measure of “Production” will be < < wdg for time> >. 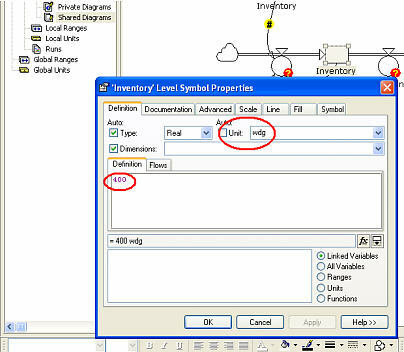 In order to correctly define “Shipments” and “Desired Inventory” there is need to add other variable ones to the model. The society fulfills under orders sending elements from the inventory. Variable called member of the women’s army auxiliary corps “Order must represent the flow of orders of the customers through one Installments”. This variable one represents an external infuence on the model. It can be used in order “to hit” the model and to reveal its behavior under variations simulated in the question. This equation uses function STEP in order to increase the orders from 100 to 120 widgets after 20 weeks of the simulation. A simple rappresentation of an order flow, but gives an idea of as the inventory it reacts to the changes of orders. Figure 3.11- The rate entering orders increases without warning after 20 weeks of the simulation In order to insert in the model the variable one in issue it is used to help name “Order Installments” connected to the variable “Shipments”. 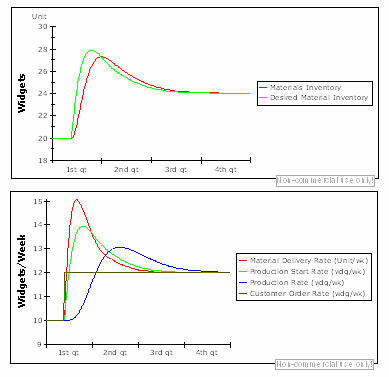 Figure 3.11- In the window of definition of the variable “Order Installments” the function of time STEP is used in order to indicate one variation of the orders Since the society adempie under orders sending its products directly from the inventory, “Order Installments” influences the variable “Shipments directly” and that comes made through a link, like shown in figure 3.11. Such connection puts in evidence that the shipments depend on the orders of the customers which describe, therefore, the behavior of the market. Although the model is not still completely ended, eseguibile can be already rendered the same model in order to see its behavior. Since “Production” and “Shipments” are measured in “widget for week” the interval of the minimal time for the simulation (Time step) must be settings to one week. 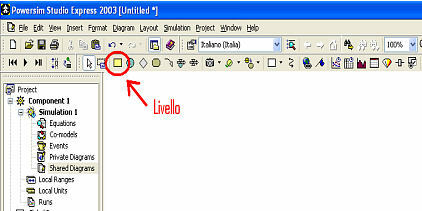 To leave the other spaces invariati and to cliccare OK.
Powersim contains a called commando “Report Car” that concurs to examine the behavior and the value of the variable ones in the diagram. Since the orders increase after twenty weeks, expect to see a decrease to us in the inventory after this period of time. In order to see this decrease better the function “Time can be used graph Report Car exactly”. Ciccare Play in order to execute the simulation. The development of the inventory will be shown in the Report Car. To the end of the simulation the shown situation of continuation will be had. Figure 3.13- After 20 weeks the inventory will begin to decrease. To the end of the simulation an inventory will be had negative from the moment that the production is not increased in order to compensate greater shipments. As it can be seen from the figure the inventory is diminished assuming a value negative. Given the new rate entering orders, that is not amazing, in how much the value of the shipments (Shipments) is greater of that one of the production through the greater part of the simulation. This has had to the fact that the variable “Desired Inventory” not rispecchia the variation of the question that verification after twenty weeks. In order to implement a sensibility to the question waited for Question must introduce the concept of “Expected Demand” (). Expected demand is an important leaves of this model because it translate the variations of the question in production variations. That is it takes to the information from the market (Order Installments) and it converts to them in actions that control the amount to produce. The question is not a physical accumulation like the inventory. However the represented accumulations the levels do not have necessarily to be physical accumulations. Since there is need to introduce a delay in the changes of the attended question, the better way than to model “Expected Demand” it is under level shape. To define it with a value begins them of 100<> that he is equal to the rate it begins them of entering orders. The Flows are the only elements that can change the levels, therefore are need of a flow in order to represent the variation of “Expected Demand”. There is also need of a factor of time in order to indicate how much time serves in order to change the question attended in real question. To connect “Order Installments”, “Expected Demand” and “Time to Change Expectations” to the flow “Change in Expected Demand”. Variable “Time to Change Expectation” represents the time necessary in order to correct the waits on the question in real question. “(“Order Installments” – “Expected Demand”)/“Time to Change Expectations””. The model hour contains one structure in order to estimate the question attended in the market (figure 3.14). It depends on the rate running order and the constant of time. This constant of time represents the time that is necessary to the society in order to change its opinion on the question in the market. What it remains to make for this model is to show like “Expected Demand” influences “Production” and “Desired Inventory”. That comes made through two links that they go from “Expected Demand” to “Production” and “Desired Inventory”. The production serves in order to cover the wished inventory and would have to always reflect the waited for question. One joins, therefore, simply “Expected Demand” to the equation of the production. It is known also, from the information given, than the inventory that the society wants to maintain it would have to cover four weeks of waited for question. In order to reformulate the equation for “Desired Inventory” there is need of one constant that represents a multiple of “Expected Demand”. Nomination this constant “Inventory Coverage” that goes connected to the variable “Desired Inventory”. Figure 3.15- Ended model. Expected Demand’ is connected to “Production” and “Desired Inventory”, and is held on account when the level of production is decided. In order to render the simulation of the more effective model to the fine ones it is prati to us that visual Powersim concurs to create diagrams useful in order to introduce turns out to you. In order to insert the variable ones in the diagram to cliccare on the icona Variable tree. On the left of the diagram the variable ones will appear all. In the same way to drag in the diagram “Production” and “Order Installments”. 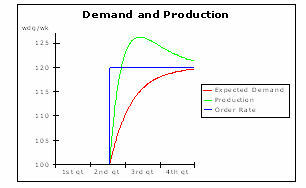 Figure 3.16- The behavior of “Expected Demand”, “Order Installments”, and “Production” in the simulation. The increment of the orders induces to a delayed increase of production and the waited for question As it is looked at “Order Installments” increases without warning after 20 weeks. Expected Demand slowly follows this change and after a cero number of weeks it door to the new level of order. The production, instead, increases, quickly like the orders. In order to understand well because the production is behaved in this way it must examine also the variable behavior of the two “Inventory” and “Desired Inventory”. 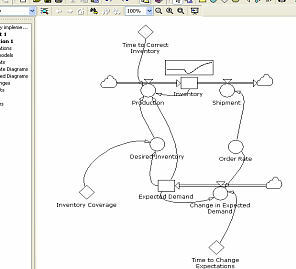 To create an other diagram of time in which inserting variable “the Inventory” and “Desired Inventory”. 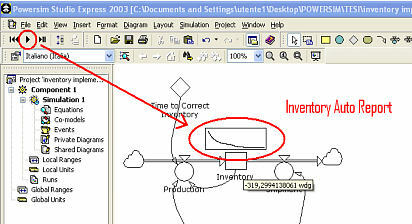 Figure 3.17- The graphical extension the inventory puts into effect them and that one wished. 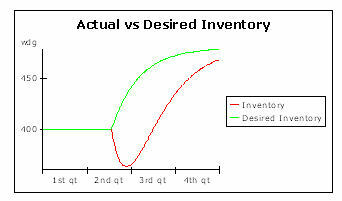 Desired Inventory grows immediately when the orders increase, but because of the delay in the production the inventory decreases before catching up the same level of “Desired Inventory”. For the first twenty weeks of the simulation all the variable ones are constant and that indicates that the model is in equilibrium. After twenty weeks the model goes outside the equilibrium because of the variable “Order Installments” that door from hundreds to centoventi widgets to week for all the rest of the simulation. This behavior constitutes a shock for the model and reveals its dynamic behavior. It turns out you of the “shock” can have had to the behavior of the other variable ones. “Expected Demand” can increase, but slowly, end when it catches up the new level of the entering orders. The rate with which it increases is slow in how much the flow changes to the question attended second the discrepancy between “Order Installments” and “Expected Demand”. This discrepancy is larger when the “shock” happens. From this moment “Expected Demand” it grows gradually reducing such discrepancy. “Production” grows above “Order Installments” before ring-establish the equilibrium. “Desired Inventory” grows anch’esso (increasing the difference between “Desired Inventory” and “Inventory”) because it is simply a multiple of “Expected Demand”. The increase of the production is also obvious from the behavior of the inventory. In this society the shipments are always equal to the order rate so that the increase of shipments begins to cause the emptying of the inventory. This increases to the discrepancy between the wished inventory and that real one. When the production catches up the rate orders, the inventory catches up its minimal level. This happens approximately after 25 weeks. From in then the production it goes here to of over of shipments allowing to the inventory increasing. After 25 weeks, therefore, as the difference between “Desired Inventory” and “Inventory” is closed and the waited for question catches up the orders, the production decreases until the attainment of the equilibrium. After approximately 70 weeks the model it is of new in equilibrium. This thing means in terms of market operations? The beauty to create a model of a system is that one to allow us to not only investigate on the structure of a system (like levels and flows are appropriate to you) but also as changes on the structure change the behavior of the system (in this case consider the performances of the system). 4.12 Increse the model: To add the back orders (Order to you Backlogs). 4.14 To add the warehouse of the crude materials (Raw Materials Inventory). In the previous one CHAPTER it has been implemented a simple model of management of a warehouse of a manifacturing industry. From the study of the famous diagram that production, inventory and question of the customer closely are interconnected between they and they are influenced vicendevolmente. The companies are found to operate in a market in which the speed and the service is indispensable requirement that push the enterprises to modify strategies and organization to the aim to reduce the Time-to-market and to operate in real time. The concept of continuous logon is developed and of collaboration with the customers, the suppliers and the partner it trades them, it delineates therefore the model of “extensive enterprise”. In the study of the productive systems an crescent has been taken place interest to the complex systems deriving from an extensive vision of the enterprise that more is not seen like independent entity, but like operating system in way interconnected with trading the partners. The Supply Chain or Value Chain is the composed total net from economic entities which as an example: suppliers, manifacturing companies, warehouses, centers of distribution. A company represents an actor who operates in an atmosphere that is not get exaustedded in the four walls of the same one and therefore in order to catch up levels of excellence it must act in way integrated and organic with other entities of business. The Supply Chain is a net of organizations that are been involved, through connections to mount and to they goes, in different processes and activity that they produce value in the shape of products and services assign you to the final consumer. The actors of a merceologico field can be several and in elevated number, this renders the concept of Supply Chain much separating but several the definitions of the same one seem rather agree. “…it is a net of resources and points of distribution that carries out the functions of supplying of the materials, of transformation in intermediate and ended products, of distribution and delivery to the customers and is composed from independent enterprises that share common purposes”. Figure 4.1- Generic Supply Chain with flows of the products and the information Every entity (system, warehouse, centers of distribution center of service etc) operating in the Supply Chain everyone represents a node of which own question has one, one sure productive ability; the main difficulty in which the agents of the chain incur is that one of the asynchronous management of the regarding information such parameters. One of the main characteristics that must have a company that operates in an optical of extended enterprise, to the aim of being able to manage in efficient way the question and the productive ability, are that one of being able itself to reshape in short times for being able to answer in timely way to the fluctuations but, above all, for being able to take advantage of the opportunities offered from the market. With the study of the Supply Chain it is passed therefore to a vision of total company that operates, or better collaborates, in order to catch up a level of efficiency that could not be caught up operating, also in optimal way, only on the inner system of management; such aspect often comes put in evidence with the use of the Supply term “Integrated” Chain that it refers to the organizations exactly, to the activities and resources been involved in the process of satisfaction of the question of the final customer. SCM is born and it is developed like logical evolution of the management of the logistics, that is like management of the process of physical distribution of the products and the relations between warehouse and functions of transfer of the products. In according to moment, to the management of the logistics other functions join and integrate which the management of the production, supplyings, the orders: the widening of the functionalities is rendered possible and is favorite from the development and the spread of the EDI (Electronic Given Interchange), of the nets of telecommunication, beyond that from the crescent availability of supports and dispositi you for the collection and the analysis of the data and the performances. In perspective which will be integrated functions the development of products, the marketing, the service to the customer, always in the optical to optimize with of activity and flows of production and exchange assign to you to satisfy the specific question of the final customer. The globalization: possibilities of purchase of raw materials to low costs from the emergent economies are created for the company new and at the same time new are created sale possibility: that determines a geographic movement of traditional localization of business and the Supply the Chain (from the supply to the production to the delivery to the customer), and renders necessary, for a company, to serve total markets and independently to assure a level of homogenous service from the destination market; it is considered moreover that the globalization has generated a total increase of the level of the competition, than in its turn imposes to the companies to operate with greater efficiency and searching and defending competitive advantages you of differentiation regarding the competitors. The area of the services to the customer and the delivery represents, today, one of the main areas of the competitive advantage. With Supply Chain Management one agrees the management of planning processes, implementation and control of all the flow of activity and communication between various subjects (companies, suppliers, partner, customers), finalizes to you to supply to the customer/consumer the assets demands to the asked conditions, elements which the customer attributes value. The Supply Chain Management can have also others objects to you: reduction of the price of the products, Time-to-market, differentiation, consolidation in niche markets. The role of the ICT (Information and Comunication Technology) in the Supply Chain Management is that one to support an informative base for the various been involved subjects, to allow the optimization of the service to the customer, to increase the communication speed, to reduce the process costs, to trace the information, to concur fast reactions to unexpected events that are taken place along the virtual chain. The methods informed to us usable in order to avoid efficiency decrease and to maintain to fluid the informative flow along the logistic chain are substantially of three types: some great companies impose an informative system common to their suppliers and subfornitori in order to slim and to simplify the process; others use technologies IP (Internet, Intranet, Extranet, email) that they allow to communicate in effective and direct way with suppliers and customers, independently from the systems legacy in use; other anchor uses ERP (Enterprise Resource Planning) that they comprise the necessary modules to the management of the entire chain of the value (between which SCM). better service and better information to the customer. The optimization of the procedures of management, supplying and delivery needs fundamentalally of instruments effective and innovated to you in a position to eliminating the problematic ones tied to the communication and the sharing of the information, to the aim to reduce in sensitive way the relative costs you (telephone, fax, hours job), the times of supplying and follow up. Instruments SCM answer mainly to this object to you, that is to the attainment of the maximum efficiency in the processes of communication and the flows informed you along the logistic chain extended (from the sub-supplier the final customer). on the operations plan, it regards the programming of the operations and the transmission in real time of the information that concur of having the acquaintance of the state of the single plant. Figure 4.2- Levels of optimization of the Supply Chain Management Always with reference to the functionalities, the SCM applications can be subdivided in two segments: Supply Chain Planning and Supply Chain Execution. The first segment groups and analyzes the contained information in the database business in order to preview the question and consequently to program the production; it can be applied for operating decisions and strategies of along term. According to segment it uses the information generated from the first one in order to guide the production, the logistics and the movements of raw materials, members and finished products, it can be used in order to determine the productive ability and to create a production plan that satisfies the question requirements and is adaptable to the changes. improvement of the satisfaction of the customer offering speed of delivery and personalizzazioni of product. communication: the communication through protocol IP and the transfer of documents through EDI concur of monitorare in effective way the various ones are made of management of the order. increment of the revenues, caught up thanks to the possibility of personalizzazione of the product. Currently systems SCM are not much diffuse, although strong increase of the installations in the next years is previewed one: such evolution will be supported also from the fast spread of Internet and the e-commerce, activity that door with himself a ripensamento of the logistic chain. That that, until today, has hindered one more wide adoption than solutions SCM, or that however it has refrained the decision to implement them, has been mainly the resistance to the organizational change, followed from the costs of implementation and long times for integration. Through the aid of the Powersim software Study extension as the structure of the management of the warehouse can be adapted in order to represent the Supply Chain in a manifacturing industry. Locally political it rations them that they create stable corrections to the organizational units characterizes them can, through interactions with other functions and organizations to cause to oscillations and instability. The instability can carry to lack of confidence between the partners of a Supply Chain with consequent behaviors that get worse the same instability. The model is developed in stages. The simplified assumptions are studied one to the time and solo after the behavior of every version is analyzed totally. This iterativo process depends on the understanding of the fundamental relations between the structure and the behavior of the dynamic system that in the long run door to the development of effective the useful model. 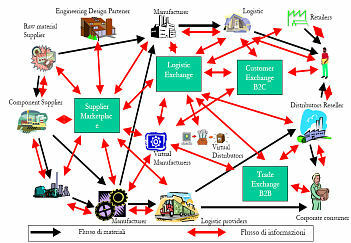 Figure 4.4 extension the political diagram of structure of a manifacturing company. The company maintains a stock of ended warehouse and satisfies the orders in the moment in which they arrive. Figure 4.4 – Political structure of the management of the warehouse In this model it begins them is assumed that the customers are sensitive to the delivery – the orders that the society cannot satisfy immediately are lost in the moment in which the customers other suppliers try. In this model it begins them the orders of the customers are exogenous (that is independent from the structure of the model). The production begins. The supply of the WIP (work in process) is increased from production starts and diminished from production installments. The manufacturing control and the decisions taken to care of the management of the warehouse from the company include order fulfillment (implementation of the orders that determines the ability to satisfy the orders of the customers based on the adequacy of the warehouse) and production scheduling (organization of the production that determines the production rate begins based them on the forecast of the question and the position of the enclosed warehouse the WIP inventory). The model includes three important negative feedbacks (negative feedbacks). The Stockout loop regulated shipments and the variations of the warehouse: if the warehouse is inadequate, some articles will go supply outside and the deliveries will fall to of under of the orders. In the event extreme the shipments will go to zero when the warehouse is emptied completely. Inventory Control and WIP Control loops modify the production in order to move the level of warehouse and WIP towards their wished level. In this model it begins them do not consider stock of materials neither restrictions of ability. Figure 4.5 extension the structure of the process of implementation of the orders (Order Fulfillment Process) and of the rate delivery (Shipment Installments). Inventory = INTEGRAL (Production Installments – Shipment Installments, Inventoryt0) (4.2) Indicate that the level of warehouse is increased from the diminished rate production and from the shipment rate. Figure 4.5- Structure of Order fulfillment “Minimum Order Fulfillment Time” is determined from the process of implementation of the orders of the company (Order fulfillment process), the complexity of the product and the vicinity of the customers to the center of distribution of the company. It represents the demanded minimal time for dealing and delivering an order. Shipment installments =MIN (Desired Shipment Installments, Maximum Shipment Installments) (4.6) This last equation says that the company delivery which can deliver or what it wants to deliver any is smallest between desired and maximum shipment installments. When Desired Shipment Installments equals Maximum Shipment Installments, some products will go supply outside and therefore the rate implementation of the orders (Order Fulfillment Ratio) will be smaller of 1. Figure 4.6 extension the typical shape for Order Fulfillment Ratio. Where SR, DSR, and MSR are shipment, desired shipment, and maximum shipment respective and OFR is Order Fulfillment Ratio. The horizontal line Order Fulfillment Ratio =1 represents the case in which shipment they always equal desired shipments. If SR is found along the line to 45° passing through the origin it means that SR=MSR: shipment it equals the maximum level that the warehouse can support. It puts into effect them relation must be narrow to the region to right and under the two lines of reference. When the company has a wide warehouse so that maximum shipment installments is the much largest one than desired shipment installments, therefore the possibility that some product will be outside supply is negligible and order fulfillment ratio is 1 – shipment it equals desired shipment. The case in which order fulfillment ratio it intersects the line of 45° when MSR< DSR and 1 when MSR=DSR corresponds to formulation SR=MIN (DSR, MSR) and represents the situation in which the question it is perfectly expectable and calculable. If not the company is an adapted warehouse it can decide not to fulfill under orders of small customers. This strategy reduces order fulfillment ratio under the reference line, in the region in which MSR< DSR. Figure 4.6 extension the political structure of the production rate (production installments). Typically the production is involved multiple steps that create meant warehouses to you of jobs in process (Work in Process or WIP). Production Rate=DELAYMTR (Production Start Installments, Manufacturing Cycle Time, 3) Manufacturing Cycle Time represents the medium time of transit for all the elements combines to you in the model. Figure 4.7 extension the structure of beginning decision production. In order ability restrictions are not considered now: Production Starts does not depend on the availability of material, job, or understood them and equipments. Figure 4.7 – Structure of production Starts The decisional rules of beginning production are formulated using one generic structure of management of the supplyes. Production Start Installments is obliged not to be negative but various it equals Desired Production Start Installments (since still restrictions of resources are not considered). Adjustment for WIP modification the beginning of the production in order to maintain WIP inventory online with the wished level. In order to supply an adequate warehouse like a pad against unexpected variations in question or production, the company tries to maintain one sure cover of waited for question (Expected Demand). Desired Inventory Coverage includes two members. First of all, the company must maintain cover to send to the waited for rate demanding a level base of equal cover to the Minimum Order Processing Time enough (the minimal time in order to work the order). According to, in order to assure an adequate level of service the company maintains adds them supply of emergency (Safety Coverage Stock). Larger it is the cover supplied from the supply of emergency, better will be the level than service. One supposes that the company previews the question so that in the model the variable Expected Order Installments is dealt like a level increased from the Change flow in Exp Orders (variation in the waited for question), like in figure 4.8. The forecast process can easy be increased in order to include periodic corrections or additional members in order to anticipate the increase of the question. To test the model would have to be a process of controlled experimentation. For this reason equilibrium must inizializzare the model in a balanced equilibrium (balanced). Equilibrium means that all the supplyes in the system are immutable demanding that the afflussi and the effusions must be equal. The model in equilibrium implies also that all the supplyes are equal to their levels wish to you. In the present model the equilibrium demands that production starts = production = shipments (the conditions for WIP and Inventory is constant); the variation in the waited for orders (Expected Orders) must be zero. In more a balanced equilibrium it demands that Inventory=Desired Inventory, WIP=Desired WIP and all the flows equal theirs object to you: Shipments, Desired shipments, expected orders, desired production, desired production starts, production starts, and production would have to equal the orders of the customers. Under these conditions adjustment for inventory and for WIP they will be zero, therefore desired production starts = desired production = expected orders = customer orders; ulteriorly when inventory = desired inventory, shipments = desired shipments = customer orders; desired inventory coverage he is sufficiently large that order fulfilment ratio is equal to one. In order to begin to test the model table 4.8 extension the parameters that will be considers you like constants for a manifacturing company. Figure 4.8- Parameters of base for the productive model While “Minimum order processing Time” is 2 weeks, the company wishes an emergency stock (safety stock) of 2 weeks adds them of cover. Given the values for order fulfillment function, inventory coverage, equal to the minimum order processing Time it would turn out, in a level of service of 85%. Adding a stock of equal emergency to 2 weeks it adds them of waited for question (expected demand) means that the shipment rate maximum (maximum shipment installments) would be 2 times the wished rate when inventory he equals its wished level, qualifying the company to fill up 100% of the orders. This first simple model that regards the management of the warehouse without to still consider the management and the finding of the materials and the back orders to you has been implemented with Powersim and the structural diagram is brought back in figure 4.9. 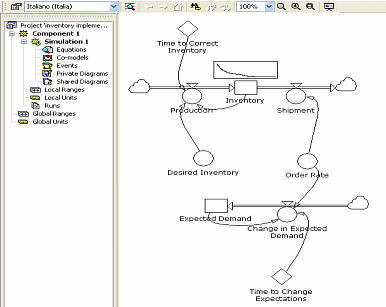 Figure 4.9- Structure of the management of the warehouse Like approval for the example of the previous understood one it, through the chosen software of simulation it is possible to visualize through time diagrams the course of the variable ones, that they constitute the structure of the system, and therefore to be able some to study the behavior. Figure 4.10 extension the answer of the company to an unexpected increment of 20% in the orders of the customers. It begins them customer order installments is of 10 “widgets/week”. Desired shipment installments increases immediately after the unexpected increment in question. Inventory coverage immediately falls from its begins them value of 4 weeks to 3.33 weeks. In the moment in which customer order installments it increases, inventory still it is not changed, therefore Maximum Shipment Installments remains same (the 20 widgets/week). The increment of the orders of 20% reduces the relationship between maximum and desired shipment from 2 to 1.67. Order fulfillment ratio to this point is over 99%, therefore the company is initially able to cover nearly all the entering orders, in spite of the increment. However, since the continuous production to it begins them rate 10 “widgets/week”, inventory falls under the level begins them. As inventory it falls, therefore the company is not more in a position to sending the goods. After approximately 7 weeks from the unexpected variation of question, order fulfillment ratio comes down to 95% causing to the loss of transactions of the company (and its reputation like reliable supplier). The difference between the wished warehouse and that one puts into effect forces them desired production to raise itself above expected orders. This makes that a difference between the level is opened puts into effect them and that one wished of WIP. Consequently, since WIP is increased from production start installments, this grows ulteriorly above desired production installments. With passing of the time the company recognizes that an accidental one rest begins it them increment in question is not and its forecast of question gradually grows. Given the 8 weeks of levelling for the forecast, it serves approximately average year in order to correct 95% of the management for the new rate order. In this period, the system cannot realize a balanced equilibrium: if inventory and WIP inventory had been equal to their wished value, the production uguaglierebbe the forecast of the question, than, from the moment that is smaller of the orders cause the fall of the warehouse. As expected orders it grows, therefore ago also desired inventory, adding a difference between the warehouse it puts into effect them and that one wished ulteriorly and increasing desired production. Production starts catches up the maximum increasing of 42% approximately regarding the level begins them after approximately 4 weeks after the unexpected increase of question. The express increment in endured Production starts fills up the WIP supply but the production is behind of 8 weeks. The production does not surpass shipment if not after that 6 weeks are passages; through this period of time inventory it continues to come down in the same way in which desired inventory it grows. Inventory stops to come down when the production uguaglia shipments. However the system is not still in equilibrium because of the great difference between the wished inventory and that one puts into effect them and between orders and expected orders. Production eventually grows above shipments, provoking the increase of the warehouse, before that it catches up eventually the new one, and more high, wished level. To notice that the maximum of the production is caught up after approximately ¼ of year after the variation of the orders, much more of the 8 chosen weeks like production delay. According to, the amplification of the unexpected increment of the question is unavoidable. Since the level warehouse must initially fall, the only way for increasing it to its begins them level and therefore to elevate it to the new one, plus high wished level is that one to make to exceed the production regarding shipments. Production must pass much above shipment installments in order to create a warehouse that equals the new wished level. Production starts must be still risen more so that the level than WIP it can be carried to a level consisting with a higher rate than productivity. Third party, the correction to the production catches up its maximum more or less when inventory it catches up its minimum. Inventory only touches the minimum after that the production finally has grown to equal shipments enough (shipments). This phase of characteristic delay of the greater part of the supplì chains, is one fundamental and unavoidable consequence of the physical structure of supplyes and flows. End hour has been assumed that, in the model, the orders not immediately adempiuti are lost in order always. Many manifacturing companies cannot deliver immediately and maintain a rear one of orders inadempiuti that it emphasizes the difference between the orders and shipments. Delay between the reception and the delivery of an order withdraws to you emerges every qualvolta is one. These delays can be caused from the administrative activities, like the necessity to personalize or to shape the product to second of the necessities of a particular customer, or delays in shipments to the place of the customer. When the costs of maintenance in warehouse are much high, the companies prefer to maintain withdraw you to it of orders inadempiuti and to use a system make-to-order if they can technically approviggionare the finished product. 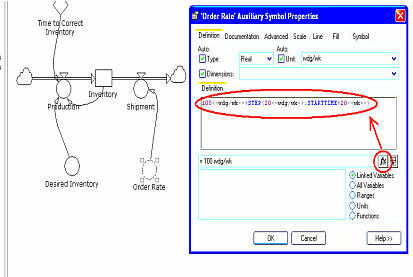 Figure 4.10 extension as the subsystem order fulfillment can be modified in order to include an explicit back order (order backlog). Figure 4.11- Structure for order backlog A order backlog it implies that delay between the disposition and the reception of an order is one. This last equation indicates that the backlog it is increased from the orders receipts and decrementato from the implementation of such orders. Order fulfillment installments is equal to shipment installments. Every time that “widget” is sent to the customer the backlog is diminished of one unit. While shipment installments and order fulfillment installments are assumed numerically equal and are measured with the same units (widgets/week), they are distinguished concepts. Shipment installments is the physical rate products that leave the company, while order fulfillment installments represent a flow of information. In the correct structure desired shipment installments are the shipment rate that will inside assure the implementation of the orders of the target of delivery delay (target delivery delay). Target delivery delay is the goal of the company for the interval between the disposition and the reception of the orders. At last, the rate the orders of the company is set up for being equal to customer order installments. In a model with multiple customers, order installments would have to be the sum of characterize them customer order installments. Figures 4.12 and 4.13 the structural diagram and the diagrams of simulation that show the behavior of the model with added of the comprising structure the back orders to you (order backlogs). The variable one target delivery delay is set up to 2 weeks. As before there is an unexpected increment of the orders of 20% from begins them balanced equilibrium. Figure 4.12- Structural diagram with the added one of the order backlogs. Although enough similar to the model without backlog, there are some thin differences. Immediately after the increment of the orders, shipments they continue to their rate begins them. Backlogs therefore ago grows and therefore also desired shipment installments. The shipments put into effect hold them initially the step, but as the level of warehouse of the company falls, order fulfillment ratio cove under 100%, causing the come down one of shipment to of under of desired shipments. Delivery delay begins to grow. First, because of it withdraws to it to you in the orders and of shipments, desired shipment it grows very gradually regarding the case without withdraws to you. As result the decrease in the warehouse is a lot graduates them, light reducing the amplification in production starts to 1.97 regarding 2.12 of the case without backlogs. The maximum in production start installments more light lingers the variation of the orders much that in the event without backlogs. According to, the orders that cannot be adempiuti immediately are lost but they remain in the backlog until when they are not sendes to you. Production installments therefore must grow over order installments from the moment in which the company it works to outside of withdraws end to you when a sufficient warehouse becomes available. Up to now the production rate begins them uguaglia always the production rate begins wished them, implying that it revives like materials, job, and understood them they are always wide. Figure 4,14 extension as the structure of the model can be corrected in order to include an explicit stock of crude materials or members. Figure 4,14 – Structure of Materials Inventory The warehouse of the crude materials is modeled like one structure of management of the supplyes analogous to the warehouse of finished products. The production can only begin if there is a sufficient supply of materials, and the company must order materials to sufficienza in order to maintain the warehouse to an appropriate level. Production start installments is reformulated for to be equal to Feasible Production Starts from Materials (beginning of feasible production from the materials), the rate with which the production it can have beginning. Material Usage Installments is analogous to Shipment installments. It puts into effect them rate I use of the material is the rate I less use of the wished material (Desired Material Usage Installments) than the supply than material it is inadequate, case in which the rate I use falls under that one wished. Material Usage Ratio is the fraction of the wished rate realized based on the adequacy of the warehouse of the materials. The maximum rate with which the materials they can be used is determined from the running warehouse and the minimal time demanded in order to prepare and to deliver the materials to the production line. This minimal cover of materials in warehouse depends on the system of management of the materials of the company and on the time of transport between the supply of materials and the production line. 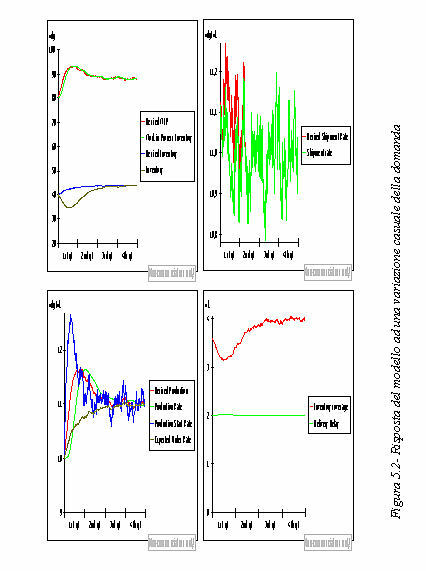 In order to facilitate the analysis of the model, and without perdeta of generality, the simulation asume Material Usage for Unit=1 material unit/widget. Minimum Materials Inventory Coverage is 1 week (1 week) and Safety Coverage Stock is assumed anch’esso equal to 1 week. Material Inventory Adjustment Time is set up to 2 week. The function that determines Material Usage Ratio is the same one used for shipments from the final warehouse. Figure 4,15 extension the answer of the model to an unexpected increment of 20% of the orders. Figure 4,15 – Answer of the warehouse of the materials to an unexpected increment of 20% in the question. Given to the parameters and the task increment of the question, the warehouse of the materials does not bring constrictions to the departure production. For which production starts uguaglia always desired start installments and the behavior of all the variable ones of the model is the same one of the diagrams of figure 4,13 (this cannot be true for one great variation of question). 5.4 Comparison between the simulation models. In chapter previous the structure of the model for the management of the supplyes has been studied under an unexpected increase of 20% of the question that then remains constant. The reaction of the system to this unexpected event is expressed in a sure delay of the answer of the variable ones in order to bring back the same system to the equilibrium. The scope of this chapter is that one to study the model, and therefore the answer of the variable ones that characterizes it, under various conditions of variation of the question. In the real world, sure, the supply chains they are not hit only once but continuously they are disturbed from variations of the orders of the customers. These unexpected variations disturb the system carrying it outside from the equilibrium, provoking a characteristic answer that constantly it depends on the structure of own feedback of the system. A flow of chance variations in the question can be thought like a continuous succession of small pulsations in the question, ognuna with one accidental largeness. Figure 5.1- Chance variation of the question. The diagrams of figure 5.2 show the answer of the system to one chance variation in the orders of the customer. As one expects to us, the supply chain it is behaved playing like a door-bell. Variable shipment the installments and desired shipment installments show this type of answer well. In the first months of simulation desired shipment it oscillates above shipment because of forehead to a chance variation of the question the company is found spiazzata initially and the warehouse comes down to of under of the wished level. After approximately six months of simulation shipment and desired shipment they catch up the same level and delivery delay it returns to its value begins them (2 weeks). Beginning from this period until the end of the simulation shipment and desired shipment has the same course, because the warehouse has caught up the wished level, and oscillates to the same way in a narrow range around to the value of 11 widgets/week that it is the medium value between 10 and 12 widgets/week. The difference between the warehouse puts into effect them and that one wished, caused from the accidental variation of the question forces production start installments to increase with an amplification of approximately 40% regarding the value begins them (10 wdg/wk). This increase has had to the fact that of forehead to a chance variation of the orders the company is not endured in degree to plan one correct forecast of the orders of the customers. In fact famous that after approximately six months the paramentri of the system only oscillates in a more and more narrow range (around to the 11 widgets/week). This evidences that the scope of the warehouse and the backlogs in a supply chain is that one tamponare the system against unexpected fluctuations of the question, naturally with delays that depend on the characteristics of the same system. Interesting to observe the behavior of the system adopting one various politics of forecast of the question. In particular it can be observed as the supply is behaved chain using the function “Slidingaverage” (medium piece of furniture) applied to the variable “Change in expected orders”. The function gives back to the average of the Input on a data period of time. The period of time for which it has been applied the average of the values assumed from the variable “Change in expected orders” is of 20 weeks. This politics have been applied are to the model with chance variation of the orders, are to the model with unexpected increment of 20% of the question. The scope of this chapter is that one to study the two models of simulation end hour examines (that one with unexpected increment of 20% of the question and that one to you with chance variation of the orders) in the various political of forecast of the question, that is that one to up to now seen pursuit, and that one to average mobile. Model with increment of 20% of the question: tables of comparison in the two tipologie of forecast of the question. To the end of the simulation, however, in both models the warehouse catches up the same level, wished par to that one of approximately 48 widgets. Various politics of management of the question, therefore, do not produce variations in the attainment of the objective, that is that one to assure an adequate level of warehouse, but in the modalities with which such objective it comes achieved. For which the company it can decide, to second of the modalities of supplying of the materials, of the times of working, etc to maintain itself more low to a level than warehouse in the first months of management in order then to carry itself to a level higher than that one wished in order to compensate the deficit it begins them (case of the mobile model to average), or to choose one political more graduates them based on which, after an unavoidable decrease it begins them, had to the unexpected increment of the question, the level of the warehouse grows gradually until catching up the wished level without never to exceed it (case of the model to pursuit). The comparison between the levels of the warehouses assumed during the simulation is useful in order to estimate the operating costs of the supplyes. An other interesting comparison, using the two political of forecast of the question, is that fact on the backlogs like index of the number of the products withdraws to you and therefore of the degree of dissatisfaction of the customer. 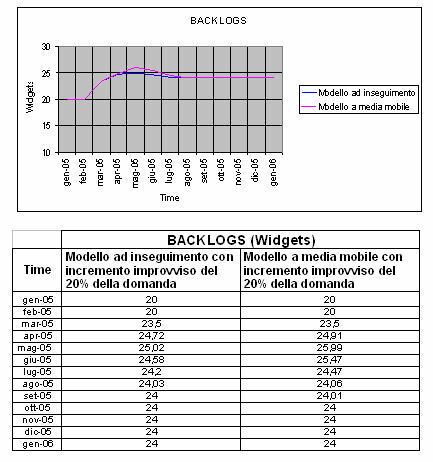 From the diagram and the famous table of comparison that using one political of forecast of the mobile question to average, in the part more high centers them of the simulation is caught up a level of products in backlogs (the 26 widgets) that in the case to pursuit (25 widgets); such difference then is cancelled in the final part of the simulation in which the for both models number of back orders door to you to an equal constant value to 24 widgets. Model to chance variation of the question: tables of comparison in the two tipologie of forecast of the question. 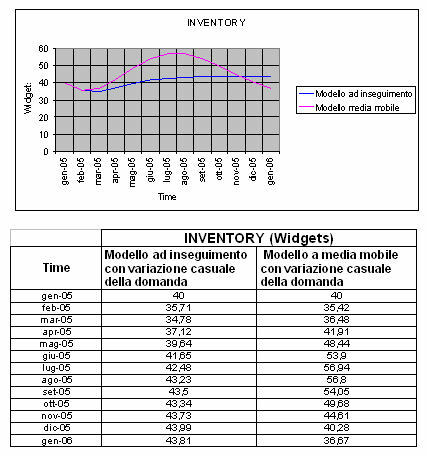 Using instead, the mobile model to average happens that the waited for orders do not have an ascending course like in the event to pursuit, but oscillates in a range comprised between 10 and 12 widgets/week assuming values that are the averages of the orders attended in the considered period (20 weeks); consequently also the level of the warehouse has a similar course. After a decrease it begins them, the level of warehouse grows catching up a maximum of approximately 57 widgets (when the waited for orders catch up the peak of 12 widgets/week) going over the wished level. After that it begins to decrease coming down to of under of the wished level. If the period of simulation grew tall it would notice that the waited for orders would oscillate in a more and more narrow range around to 11 widgets/week, while the peaks minimums and maximums of the level of warehouse would be always approached more the wished level. From the diagram and the table of comparison evince that I use it of the two political different of forecast of the question in the event of chance variation of the orders of the customer do not behave substantial differences in the management of the backlogs. The job has been oriented to the development of models of simulation of one supply chain based on the approach system dynamics. This language of graphical modellazione is one of the great advantages of the models constructed with Powersim Study and offers the possibility to create clear and transparent structures. To be developed a simulation model, for the management of the warehouse supplyes, in order to test the main potentialities of the software and its characteristics. After to have defined all the variable ones and to have inizializzato the system in equilibrium, the object of the study has been that one to observe the behavior of the model under various conditions of variation of the orders of the customer. 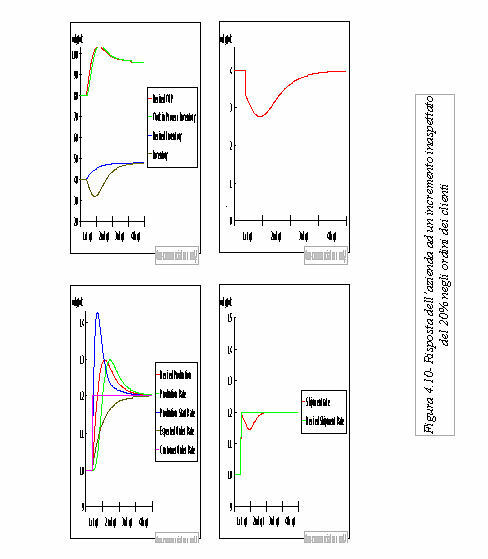 Such study has been facilitated from the possibility, offered from the software, of being able to bring back in diagrams and tables the course of the variable ones in the period of simulation and to be able to confront them is in the event of various conditions of the question (unexpected increase of 20% or chance variation) is in the event of various political of management of the waited for orders (model to mobile pursuit or average). The comparison has allowed to evidence the meaningful variations in the management of the warehouse and of the back orders to you. The simulation with Powesim Study allows therefore to develop and to examine various strategies in a computer before perfecting them in the real world. 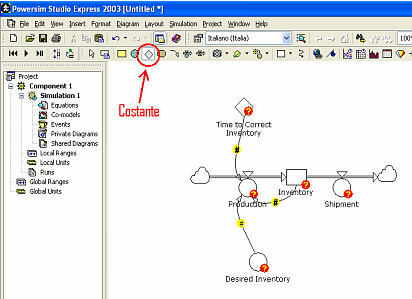 An other characteristic that has been thought important in the study of the simulation models is that Powersim offers the possibility to directly communicate with Microsoft Excel to the aim to render available diagrams and tables of comparison that concur to visualize the differences in adopting various strategies of management of the supply chain. As far as the phase of learning of I use it of the software has been stated a sure difficulty begins them due to the clarity and semplicità of the handbook of the customer above all as far as the mathematical functions not to associate to the variable diagrams (flows, levels, constants, etc..). Fortunately the presence, inside of the package software of tutorial demonstrated to you has rendered little ostica the phase than study. After all it can be asserted that, given the dinamicità (es. variability of the question) and chance (es. previewed indisponibilità of a machine) of the productive systems is not always easy to answer in precise way to questions that imply important implications are economic that operated to you. The dinamicità sets up from the market, the requirements to arrange quality and costs, integration of the factories in the optical of the supply chain force to ristudiare the production processes constantly. In this optical the simulation is an effective instrument in order to help the manager to take decisions in optimal way is to operating strategic level that. In the model to chance variation of the question, using mobile politics to average for the attended orders, the level of the warehouse grow to of over of the wished level in order then decreasing in the second part of the simulation; using, instead one political to pursuit, the level of the warehouse after a decrease begins had them to the chance variation of the question grows gradually until catching up, without never to exceed it, the wished level. 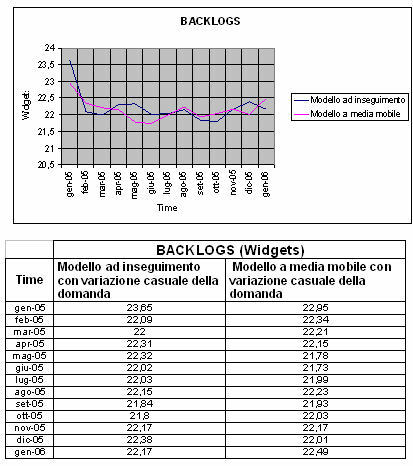 In the model with variation of the question to step using one political of forecast of the mobile question to average, in the part centers them of the simulation catches up a level of products in backlogs (the 26 widgets) more high that in the event to pursuit (25 widgets); such difference then is cancelled in the final part of the simulation in which the for both models number of back orders door to you to an equal constant value to 24 widgets. In the model to chance variation of the question I use it of the two political different of forecast of the question does not involve substantial differences in the management of the backlogs. The phase experiences has regarded them ….but the analyses of comparison or study in general terms of a productive system can be extended to all the others members of the model (es. to the productive phase, the finding of the crude materials, etc) and this based on the specific requirements of the company to the aim to find one correct solution for a oculata management of all the system. The job developed in this thesis is a departure point that has put in evidence the potentialities of the used software. They have been analyzes some aspects to you of the management of supply chain, regarding a management of the warehouse under various political of forecast of the question, but the analysis job can be widened to all the rest of the system (finding of the materials, production, etc).